It's seven a.m. I have already broken up a fight, threatened somebody ambiguously with "serious trouble," and been told that I'm mean and make Rowan sad for-EVER. I'm wearing yoga pants and a nightgown simultaneously because I got sidetracked by the fight halfway through getting dressed. Then I started checking my email. Until this week, I thought I was quirky. Then I read Amanda Jo's blog and found out I'm not quirky, I'm messy and possibly ADD. She and I joined the "Messies Anonymous" email list. I've been ignoring the yelling from downstairs for five minutes. I just realized it was Haydn yelling for someone to bring him another roll of toilet paper. I'm fairly certain I only wore one earring all day yesterday. When I went to take it off, I saw the other one sitting on the counter, but I couldn't remember if I'd just put it there or if I never put it on. See, that's why I joined a support group. I really like to sit in my car. When I get to the store, or when I come home, I typically stay in the car for at least five minutes. I think it's because it's quiet and warm and my children are strapped in. That makes it a good time to go through my mail or check Facebook. If my kids aren't with me, I will sit even longer. I ran into a problem the other day though, because just as I was about to get out of the car at Home Depot, another car pulled into the spot next to me. "No problem," I thought, "I'll just let them get out first." But they didn't get out. They sat, and sat, and... sat. So I waited and waited and waited because I was sure the second I went for the handle they were going to fling their doors open too. What are the chances of me winding up next to another sitter? After several minutes, I finally sprung from my car, grabbed my baby and hustled away without making eye contact. Does anybody know the proper etiquette in this situation? 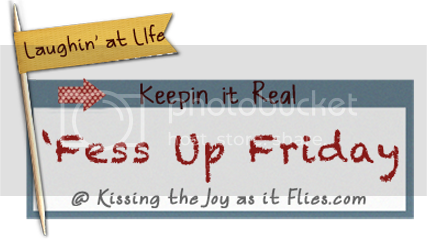 Your Friday comments are always my favorites because I love to hear your 'fess ups! If you're playing along this week, grab a button here to include in your post and leave a comment with your link. You totally got me on that April Fool's Joke, until I scrolled down. Sneaky, sneaky there ma'am. Seriousy, that Messies Anonymous site is awesome!! Let me know how you like the book!!! I wonder if these girls were just making this up...it sounds a little farfetched to me. oh i wish it were true!!! i fully intend to link up someday, such a fun link-up. this week, my fess up is that i spent half my 'work-out' time at the Y just sitting on a bench reading while eli played in the kid zone. totally worth it!